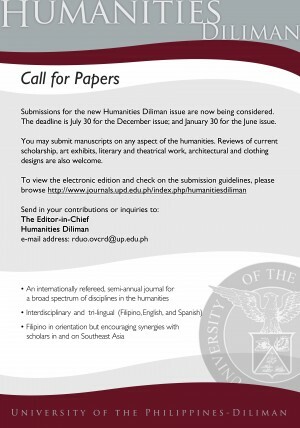 The Research Dissemination and Utilization Office of the Office of the Vice Chancellor for Research and Development, University of the Philippines Diliman is now accepting papers for publication in the Humanities Diliman: A Philippine Journal of Humanities. 1. Manuscripts must have a high degree of scholarship and social impact. They will have to be approved by the editorial board and by selected national and international referees for publication. 2. Reviews of current scholarship, art exhibits, literary and theatrical work, concerts, architectural and clothing designs, etc. are welcome. Manuscripts written in languages other than English must be accompanied by an abstract in English. 3. Manuscripts should not be less than 5,000 words but not more than 10,000. Reviews must have up to 1,500 words. All manuscripts must be typed double-space. 4. All contributions must be accompanied by a soft copy in Microsoft Word, in a diskette, or CD. 5. All contributions must be original and must not have been published previously. 6. Research procedures must be strictly followed. Citations or other forms of acknowledgment of sources are a must. Manuscipts must use the MLA style sheet. References must be listed at the end of the manuscript. 7. It is the author’s responsibility to secure permission for the use of copyrighted materials. 8. Photographs should be of good quality, black and white or color prints. Color slides and digital photographs (300 dpi and above) are also acceptable. Line drawings or maps should be original in black waterproof ink on separate sheets. 9. Contributions must be free of jargon. If technical terms cannot be avoided, a glossary must be supplied. 10. Contributions should be accompanied by approximately five lines of biodata, which should include the author’s present position and area of work as well as previous publications and posts and other relevant information.